Part 3 of this series. I wrote this article after viewing 23:23–05:35 (6 hours 12 min) on 4 November 2018. Seen: 10 hours 27 minutes. Remaining: 13 hours 33 minutes. 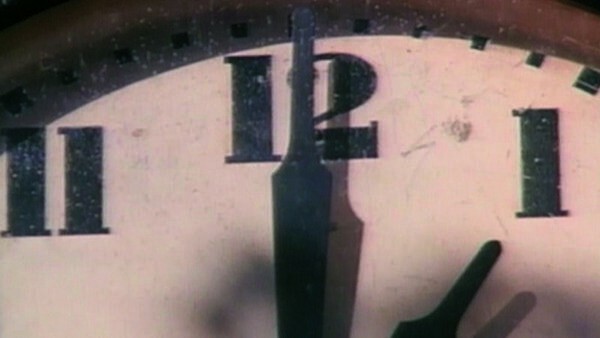 Christian Marclay’s The Clock (2010) is an ambitious 24-hour montage stitched together from feature films and TV shows. Each clip, ranging from a split second to a few minutes, takes place during the time of the day at which it is played. Over the next few months, I will be attempting to see all twenty-four hours at the Tate Modern in London, documenting the experience in a way as haphazard as the fractured experience of watching the work itself. The Clock does not ask for the time and then steal your watch; it asks for you to watch then steals your time. Part 2 of this series. This article was written after viewing 11:21–13:06 (1 hour 45 min) and 14:30–15:25 (55 min) on 24 October 2018, for a total of 2 hours 40 minutes. Seen: 4 hours 15 minutes. Remaining: 19 hours 45 minutes. Read Part 1: Introduction, in which I talk about my initial excitement about the return of The Clock. Part 1 of this series. This article was written after viewing 13:55–14:30 of The Clock on 16 October 2018. See also Part 2 in which I watch around 3 hours of the afternoon. Several years ago I watched Winter’s Bone (2010) and thought it was quite good, opening my eyes to rural devastation in America. I read a bit about it and found out that the director, Debra Granik, had directed a film in 2004 called Down to the Bone. It aired in July on Film4 and I just got round to watching it. It shares with Winter’s Bone themes of poverty, drug abuse, and desperation, but it finds its desolation in the life of a coke-addicted mother in upstate New York, rather than in the grim family ties of the meth-addicted Ozarks.